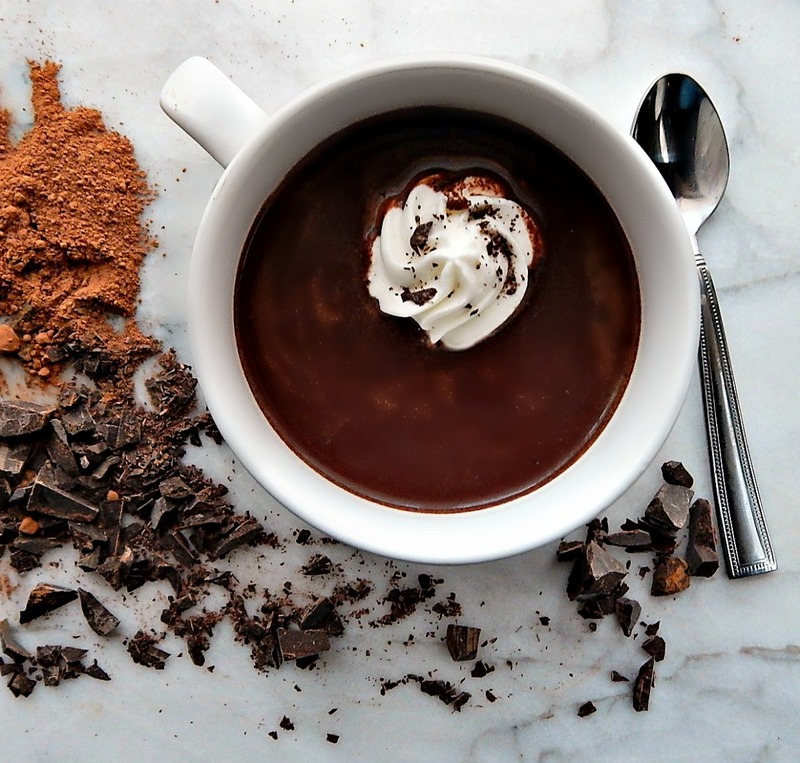 This hot chocolate is an indulgence, maybe for a more grown up taste. It’s a beautiful thing. The recipe says two servings; feel free to make more. Or feel free to take those two servings and dump them all in your giant mug and crawl into bed like a feral cat, sip it while you binge watch Netflix. Or blog. Or talk to your girlfriends. And hiss at anyone who dares to open that door. I co-hosted Fiesta Friday Blog Party this last week, which gives me the opportunity to rub elbows with all kinds of bloggers from around the wold, all bringing their best recipes. You’ll often see links at the bottom of my posts to Fiesta Friday. I straight up stole her idea of the double chocolate and upped the game on my fave Best Hot Chocolate. The cocoa really adds a lot of depth and dimension, A bit of an edge, maybe. I play with the dairy, depending on what I have. Milk’s a given, but a drizzle of cream at the end. Ummm. And I love my Frozen Whipped Cream, more than marshmallows, as a topping. Check out the “recipe” and know that until you taste that ice-cold whipping cream slowly melting into the pool of hot chocolate, you haven’t lived. Well, that’s a bit dramatic, but it’s a simple pleasure you won’t want to miss. Add cocoa, chocolate, sugar, espresso powder, if using, and a pinch of salt to a pan, preferably a pan with a slighty rounded bottom. Over medium low heat, while whisking, add about 1/2 cup of milk and continue stirring until chocolate has melted. Use a spatula or a spoon to reach into the “corners” of the pan. Whisk in the remainder of the milk (but hold off on the cream) and turn the heat up to medium, continue to stir until hot but not boiling. Turn off heat and add cream, if desired. Garnish with Frozen Whipped Cream or Marshmallows and a few gratings of chocolate, if desired. I’ll be posting this recipe at Fiesta Friday 200. Be sure to stop by and vote for your favorite recipes on Tuesday! This entry was posted in Click here for Fabulous Food Posts and tagged Beverages, Chocolate, cocoa, Cream, hot chocolate, milk. Bookmark the permalink. lol! You won’t go wrong with that! Hi Ann, this is such a good one! Perfect for a winter night. Have to give it a try to see if it is the best, but it looks amazing! Oh, my Goodness, Juju!! Ok, I’m going to have to up my game, haha!! lol, Jhuls, I guess the sad old regular whipped cream would suffice in a pinch, haha!! Seriously, though keep the frozen in mind for when the freezer is fixed. Gosh, it is SO good!! 🙂 It’s all I can do to go make a cup of it right now. It’s almost too bad I stocked up on chocolate!! Oh Jhuls, it’s so much better than the mix – you will never want to go back after you have it! I think I’ll be motivated to make it again and again when I get to try this! So I need to make it very soon😍 Thanks, Mollie! So rich and delicious, love the addition of the espresso! Frozen whipped cream! I went over to read that blog too. By the way I love shopping at Aldi. I’ve not made real hot cocoa forever. This will beat out those little packets absolutely. Thanks for sharing. Hi Nancy. That frozen whipped cream was such a fun discovery for me! 🙂 I’m sure this hot chocolate costs a lot more than the packets, but I’d rather have one mug of this than whole package from the box! Oh yeah, just a teensy touch to enhance the cocoa or more if you love coffee. More for me in that case Mollie as in a big coffee fan! Yum this looks extra chocolaty! Oh it was wonderful! I’m trying not to make it yet again, lol!! Had it three times last week! I WANT a cuppa this right now!! It’s a cold and dreary day and would be just perfect. Hi KR! Wish I could give you one!